In this week’s packed newsletter Chris Davies raves about his amazing volunteers, adidas Boost your running, three UK parkrunners head off to New York City, Lucozade offer four pairs of race entries to the Bath Half, Clare and Mary update us on SparkLE-2 and I wax numerical. My own barcode (A6013) is pretty dull, although as James Kemp (Marple parkrun ED) pointed out it is also a road between Bamford and Ashopton near the Ladybower Reservoir in Derbyshire. His is a fish pump part number apparently, although I'm not sure exactly what a fish pump is? 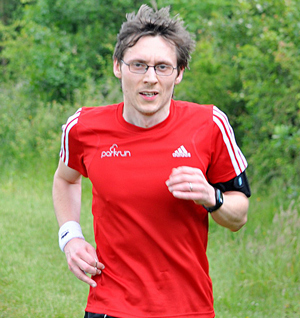 Simon Bruce Lake said that his parkrun ID of choice would be A2 as he felt the husband of Jo Sinton-Hewitt should have A1, Paul's ID is actually a rather mundane A1674. The lowest registered parkrun ID is A5 as A1 to A4 were put aside for a rainy day, not sure why. The owner of that wonderful piece of parkrun identity, Abigail Storms, has sadly only run three times, all at Bushy and not since 2005. Fortunately we don't have to look too far down the list to find our shortest ID still being used, Abu-Turab Bharwana has taken A6 across parkrun finish lines in 2005, '08, '09, '10, '11 and as recently as his 45th run in September 2012 at Richmond Park. A100 is rather fittingly a member of the 100 club thanks to Andrew Allen who ran his 157th event at Bushy last month. A1000 is a little less prolific but thankfully still in action with John Taylor. Sadly A10000 is yet to be taken out of the wrapper by Eleanor Horsman, however A100000 can regularly be seen at Brighton & Hove with Jane Pidgeon. The million dollar question of course is who will end up with A1000000? As for patterns, John Broom suggested A54321 for some Manfred Man Nostalgia, unfortunately that rather cool ID seems to have been retired by Colin Robertson after just four runs at Black Park. Sadly the combined run count for A12, A123, A1234, A12345 and A123456 is a meager 35 and it's been three and a half years since any of those have turned up on a Saturday morning. Despite spending a good few minutes trying to think of some funny ones my mind remained blank, Jono Cook and Sarah Stott did go back to school however with A58008 and A55378008. We'll have to wait a while for the latter but the former is owned by John Goalen, a regular runner at Bushy. If I could choose my own I might go for my birthday A270674 which sadly Ama Acheampong has yet to run with, A42195 (the number of metres in a marathon) which Davinia Williams (nice surname) carries round Wycombe Rye parkrun or maybe the simple yet appropriate A5000 owned by Bushy parkrunner Stephen Barry. I would have quite liked the recently awarded A400000 but that ended up in the Southern Hemisphere with Sarah Brocklehurst of North Beach parkrun in South Africa. Last time I looked we were only about six or seven weeks away from A500000 saying hello to the World, I wonder where it will be? adidas - the running revolution is coming! We all know how important energy is, especially first thing on Saturday mornings! Despite our best efforts to wake up early and keep going, our energy has limits. We could all do with having more energy. Now our energy will be endless with BOOST: more energy return with every step, every metre and every parkrun. With more energy return than just normal EVA foam which is used in most running shoes. In December 2012 we picked three parkrunners - Ruth Martin, Dan Bayles and Ben Stevens - to receive the prize of a Virgin London Marathon race place and embark on a journey which will Boost their marathon experience. So far they have joined us at ‘Meet the Experts’, a weekend at the University of London where consumers receive all the advice they could need to Boost their Marathon experience. On the 13th of February 2013 they will be flown to New York, USA where the global launch of the BOOST technology will be unveiled to the World’s media giving them the chance to discover what they can do with endless energy. Stay tuned, in the coming weeks we will have reports from the lucky winners on how the Boost experience is changing their running. Looking for a running challenge to motivate your training? The Lucozade Sport Team has four pairs of race places at the beautiful Bath Half Marathon on Sunday the 3rd of March to give away. If you would like to be on the start line email parkrun@fasttrackagency.com and tell us in no more than 100 words what three things are essential to your running performance. Entries must be received by 5pm on Wednesday the 13th of February. Winners will be selected at random and will be notified by 5pm on Thursday the 14th of February. Please include your address, phone number and date of birth in the email. Terms and conditions apply. You must be 18 or over to enter. Good luck! Recruitment for phase two of SparkLE (Study of parkrun on Lifestyle & Exercise) is now complete and we are delighted that 881 new parkrun registrants have joined the study. We will be following up with these individuals six and twelve months after they initially registered to assess any changes in physical activity, fitness and well-being over time. Thank you to everyone who has taken part to help us explore if parkrun has a measurable impact on participants. Please check your event’s news pages for the most up to date information. Cardiff Council are working with parkrun to put on a second parkrun in Cardiff based from Channel View Leisure Centre in Grangetown. It needs volunteers to help get it off the ground, so if you are interested please contact Phil Cook using the subject title 'Grangetown parkrun'. - Swindon parkrun is cancelled due to a CaniCross event taking place in the park. - Falkirk parkrun is cancelled until April due to ongoing Forestry Commission work to improve paths meaning parts of the course are unavailable. Having just read your newsletter today (Wednesday the 30th January) I have to say I totally agree with the comments and likely outcome. Whilst I get ribbed at Frimley Lodge parkrun regularly about my lack of runs and t-shirts it never bothers me. I’ve no idea how many volunteer roles I've completed but know that it would easily equate to a 50 if not 100 shirt if I had completed the same number of events as a runner. But I don't volunteer to get a shirt or extra points or for any reward or even any recognition. I do it for the pleasure of knowing that another successful parkrun has been completed safely. I also firmly believe that people should not be forced to volunteer or made to feel bad if they don't. parkrun is about running not volunteering, and yes the run cannot go ahead without a couple of volunteers but the essence of parkrun is to get people running. We are lucky at Frimley Lodge parkrun that we do not struggle to get volunteers but the people I know do it more for their own benefit even if that in turn benefits others. Usually just to give something back to parkrun or because they enjoy it but sometimes to stay involved with their running mates through periods of injury. I have also seen however a natural increase of volunteers over this month so it's been good to raise awareness of the subject. Just a quick note to say I couldn't agree more with all the latest sentiments in your newsletter. Just discovered parkrun six months ago and it has quickly become one of the genuine highlights in my running. The volunteer atmosphere is one of the best things about it and I the day I volunteered I got back way more in the shape of a feel good factor for the day. The reward is the boost to our happiness, wellbeing and sense of connection to like minded folk who like a parkrun on a Saturday morning. Keep up the fantastic work and thank you very much for it. I agree with Tom wholeheartedly on his piece about volunteering, in particular that volunteering is done for the pleasure of it and not because there could be some material reward or appearance on a league table. In fact I consider volunteering a privilege in that I have been able to give something back to parkrun, as it has given me so much - the health, the fitness, the community spirit and friends for life. I’ve run over 100 parkruns now and fulfilled over 200 volunteer roles and I’m equally proud of both totals, long may they both continue to rise! Wishing the parkrun team continued success. Just to confirm and reassure Tom: no volunteers have ever walked off with my telly or anything else! On the contrary, they've all turned up with stuff to add to the fun, like wine and beer and chocolates, despite us telling them not to. Our Bushy parkrun Volunteer Parties rock and long may they continue! PS I agree with your views on volunteering! Very well put. Just read Tom’s article regarding the volunteering and may I say I love parkrun. I volunteer most weeks to run with a visually impaired runner who has now become a very dear friend which, to be honest, is reward enough. Had it not been for another very good friend telling me about parkrun this second friendship would never have existed. I always remember to thank the marshals (even when out of breath) which I think sometimes amazes and surprises them. At Colwick parkrun there are many individuals who volunteer week in and week out, all smile and chit chat with the runners prior to and after the run and believe they too do the volunteering because they want to and not for some type of gain. Keep up the fantastic work. I, and many others, appreciate parkrun for many different reasons. Mine are the friendship, everything that it brings as well as it being a well organised timed event. Thank you for another thought provoking piece last week. I appreciate you sharing your struggles with how, and if, to reward and recognise volunteers. I thought you did so sensitively and eloquently. As an occasional runner (more enthusiasm than talent unfortunately) I am more than happy to volunteer to support parkrun and the team at South Manchester. I've been made to feel really welcome and encouraged, even as a red faced, middle-aged stout lady at the back! As I have a ready supply of enthusiasm, I loved the idea of being invited to volunteer. It's one way of saying thank you and once in-situ and with my high-viz vest I can encourage all my fellow runners. Many of them say thank you as they pass and for those who can't speak for lack of breath there is often a wave or a nod of acknowledgement. I've met some fascinating fellow volunteers and I've never, ever felt put upon or taken for granted. I really don't feel the need to be rewarded. Being able to participate when I can, where I can, for free and then be acknowledged by fellow runners and our committed Run Director are more than enough. Indeed, I feel I should thank you for being so inclusive. I'm no athlete, I'm hardly a runner really but I'm both when I go along to parkrun. Amazing newsletter last week from Tom! I've not done Norwich parkrun since April 2012 and I used to be there every week religiously but for reasons still unknown (and justifiable) to myself my attendance has slipped dramatically! Your diplomatic and eloquent words have fired me up to get involved again. I am eternally grateful to each and every volunteer, organiser, sponsor and fellow runner for making this an amazing event. Keep up the fantastic work and kudos! I am a fairly new parkrunner at Glasgow parkrun. I volunteered for the first time two weeks ago and I totally agree with you that volunteering should not be rewarded for that is not the essence of volunteering. For me the reward was all the smiling faces and the number of people who thanked me on the way round even if they were running fast or struggling near the end. That was the feel good factor of volunteering. I appreciated my thank you email and will be delighted to volunteer again. I think a material reward would totally give the wrong message. Thank you for all the hard work of everyone that helps make parkrun happen. For me it is not just about the running and keeping fit but also about meeting nice people and even at the age of 58 being able to run with my daughter when she is free to participate. 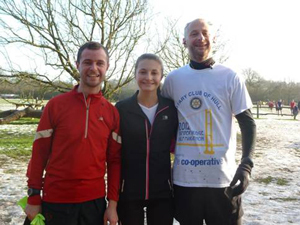 On Saturday the 26th January I arrived at Rushcliffe Country Park for my first parkrun. The conditions were icy and cold and I was early so as a result met some of the volunteers. Despite me 'butting in' on their briefing session they couldn't have been more helpful or friendly. I was early as I was unsure if I was allowed to run with my dog Taupo and young son Hugo in his pram. In the recent past I have been used to attending paid events where you cannot bring the family along, so to speak. It was such a joy to be told that of course they can be part of the run and that its not a race. I instantly felt relaxed and I had a very enjoyable run. As a running mum with a husband who works shifts, I have found it very hard to return to running and even harder to go to my local running club. I have spent the last two and a half years running on my own so it's such a joy to have found a place where I can run with others. Thank you from the bottom of my heart for setting up parkrun. I shall return to Rushcliffe and have already put my name down to volunteer. I have been running for eight months now and started with my wife, both at the age of 43. parkrun is fantastic motivation and just over three miles is just right for us. We brought our six year old daughter Typhaine down to our local Brueton parkrun and has since done 12 runs in 2012 and her 13th run in January, all without stopping. The best bit is that she thoroughly enjoys her Saturday morning run and we are all going to volunteer this year to show our thanks for the events. A big thank you to all the organisers and volunteers. I’d like to thank Tom for his very thoughtful reflections on volunteering. I am a volunteer who rarely runs due to knee problems. I love volunteering for itself, I have met a great group of people, have fascinating conversations, laughs, companionship and the oh so wonderful coffee after the run. There is nothing like seeing people do something they love. The positive spirit is infectious. I cannot imagine a better way to start the weekend, except for running itself. After being introduced to Hull parkrun when I visited my family in October 2011, it has taken me awhile to become a parkrun regular due to a few things including marrying my lovely wife Louise in 2012 and the closest parkrun being a 20 minute motorway journey away. However, the warm and friendly welcome from those at Worcester parkrun has helped me to strive towards double digit parkruns and pushed me to run longer distances through joining a local running club, ‘CLC Striders’ in Cheltenham. I used to regularly run listening to music but now love to share a “hello”, “good morning” and “it’s hard this week” to the fellow runners. The event team do a fantastic job and there have been some special moments such as seeing a regular run his 50th parkrun backwards and the warm wishes that were given to Eddie (a fantastic volunteer who has a corner named after him) after a recent operation. Many of my friends and work colleagues cannot understand the community feeling that everyone gets when attending a parkrun. I personally never would have thought that I would enjoy running a 5k at 9am on a Saturday morning but the feeling of a PB is indescribable and worth the early mornings. I’ve even started trying to get parkrun included when we go away for the weekend. I’m also very much looking forward to my first visit to Bushy parkrun in early March, mainly to see what the fuss is all about! My family from Hull visited over the weekend of the 26th of January and whilst their parkrun tourist ventures have taken them as far afield as Sydney in Australia (any excuse! ), this was their first taste of the Worcester course and we are pictured below at the finish. Both of the tourists enjoyed the course and afterwards joined parkrun widows Louise (my wife) and Rita (my mum) for tea and breakfast in the café. However, soon will be my last regular parkrun at Worcester as a new parkrun is starting in Cheltenham on February the 16th. Whilst I’m looking forward to a parkrun closer to my home, I am certainly going to miss seeing the friendly faces at Worcester. So I’d just like to thank everyone at Worcester parkrun and hope to see you visiting Cheltenham parkrun soon. Left to right: Clark Lawson, his sister Eleanor and his father Ray. Last Saturday was the inaugural parkrun at Temple Newsam. After the disappointment of cancellation the previous week the excitement and anticipation had built again. As I jogged into the park it was clear that it was going to be a great parkrunday. There was bright sunshine and blue sky and as people arrived and converged around the House there was a real buzz in the air. I feel very privileged to have a parkrun so close to where I live that is organised and attended by such passionate and enthusiastic people. Thank you parkrun. Thank you Ronnie and the rest of the team (I know it's been a bit of a long and bumpy road) and thank you to everyone who was in the park on Saturday morning! Occupation: I currently look after events and filming requests. Favourite volunteer role: I have a soft spot for the marshal role. What do you do at parkruns: First and foremost I run and occasionally so with my daughter in her running buggy. I also understand how important it is to contribute in some other way, so I administer the Riddlesdown parkrun Facebook page and write the run report every now and then. I have also volunteered on the day in the roles of photographer, marshal and registration at Riddlesdown parkrun and have recently started to help out at Bushy Juniors parkrun. How has parkrun changed your running: parkrun has given me the perfect platform to turn running into something more playful, so I set myself goals such as parkrun streaks (and anti-streaks). One goal I set myself was to run a streak of 50 official parkruns. What do you like about parkrun: The best thing about parkrun has been the amazing community I have found at Riddlesdown. However, touring is also something that I enjoy. So far I haven't run at a huge amount of venues but I am enjoying waking up on a Saturday morning and having a slightly different experience each time. It's not until you visit different venues that you see that each team of organisers have a completely different way of running their event. Some arrive well before 8am and have tables, chairs, gazebos, course signs and a whole army of volunteers in place by 9am but then at other events the organisers arrive at 8.50am, giving them more of a flash-mob feel. No matter which style I stumble upon they all seem to work equally well. Most memorable or funniest parkrun moment: My most memorable moment was the one where my two year old daughter was presented with her own bespoke volunteering vest. She loves wearing it on parkrunday! One of the benefits of being an Event Director of a parkrun which has now become well established is that the weekly task of selecting volunteers has become something to look forward to. The volunteer community at Newport has grown in size and experience enough to enable me to mix new recruits and core team members confident in the knowledge that our runners are in good hands. When I planned the volunteer team some weeks ahead of a recent event (which we held a few weeks ago) I could not have known what I was subjecting them to. I took the rare opportunity to run but questioned my own sanity as howling winds and driving rain woke me before my alarm. As I arrived at our course any uncertainty about stepping out into the cold wet morning were removed by the smiles and humour of Merve, that day’s Car Park Attendant and Tail Runner. At the start line, wrapped up warm were the happy band of Run Director, Barcode Scanner, Number Token Giver plus marshals all equipped and organised. Their additional motivation services offered throughout my soggy slog was very much appreciated. Judging by the forecast, this scene happened at parkruns all over a wet and windy UK. So huge thanks to all parkrun volunteers, who throughout the wettest year on record last year have turned out so we can all run our favourite Saturday event and also for the years ahead too. Every parkrun event relies on volunteers and in 2012 alone over 20,000 of you came forwards and supported your local event. Volunteering is a wonderful way to make friends, feel great and have fun. If that sounds like it's for you then please contact your local event team for more details. Health insurance that rewards you for living well.